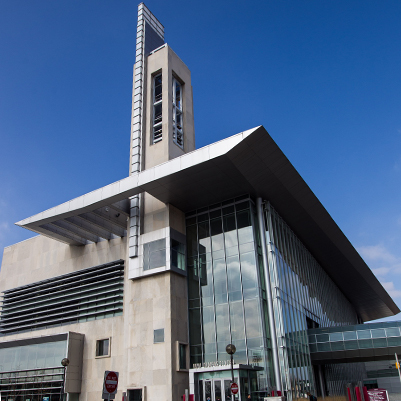 A building with 148,052 assigned square footage (asf) was constructed at the southwest corner of the intersection of University Boulevard and Michigan Street at IUPUI to house various student services and student activities functions, which include a bookstore, credit union, and other similar auxiliary services and activities often found in student union-type facilities. The building also has a food court. Within this building, about 40,835 asf of space houses activities of an academic administrative nature. The building is a focal point of the campus, with a modern clock tower that makes it recognizable from a distance. Exterior materials include Indiana limestone at the major Vermont and Michigan Street facades, with expanses of glass along University Boulevard. Brick and metal materials were used for subsidiary facades and elements.